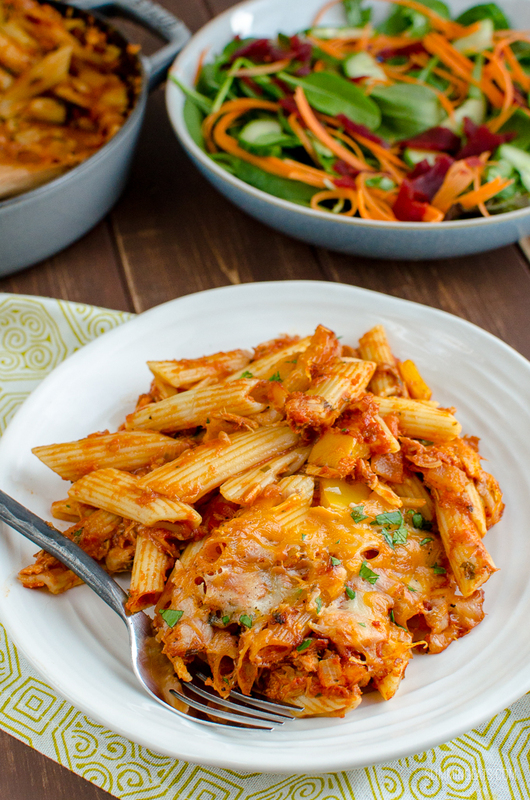 Delicious Syn Free Tuna Pasta Bake – a perfect meal any day of the week for the whole family, using simple easy ingredients. 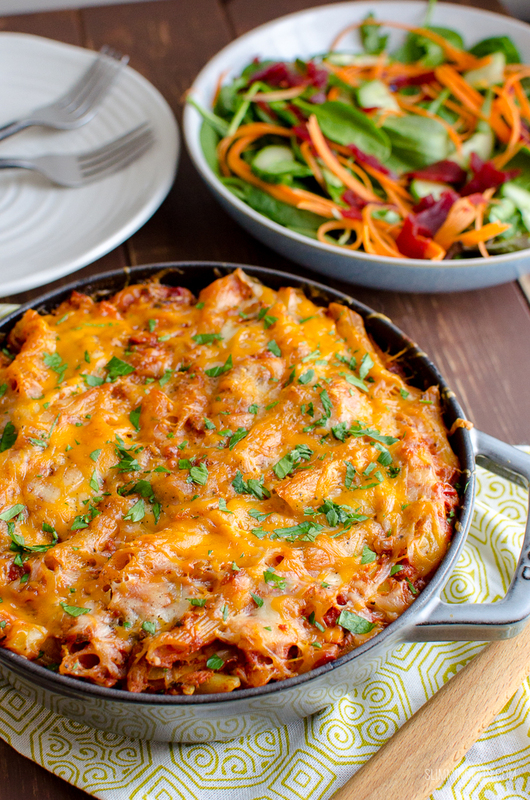 This is probably the perfect dinner to make when you fancy a pasta bake. Using basic ingredients we always have on hand in the pantry/cupboard. Pasta, canned tuna, passata, tomato paste, stock and a few fresh ingredients just to up those speed foods. This really is such a tasty meal that can be on the table in less than an hour. 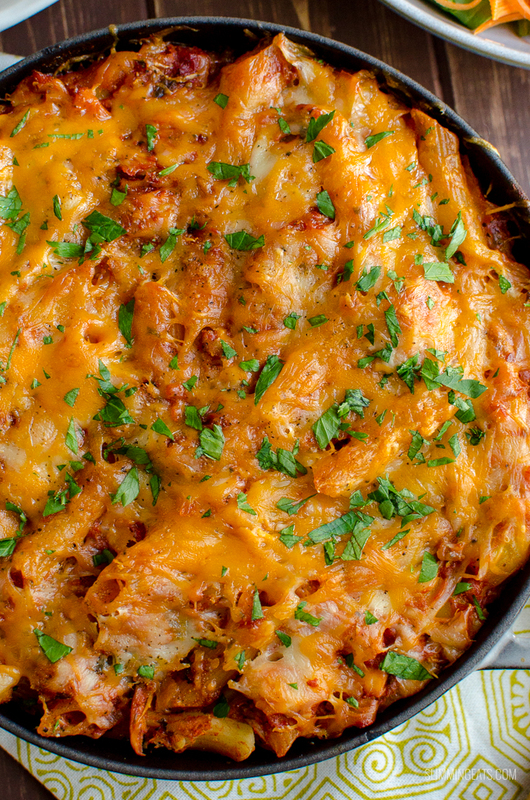 My kids love this pasta bake, all that yummy cheesy topping using a mixture of cheddar and mozzarella. 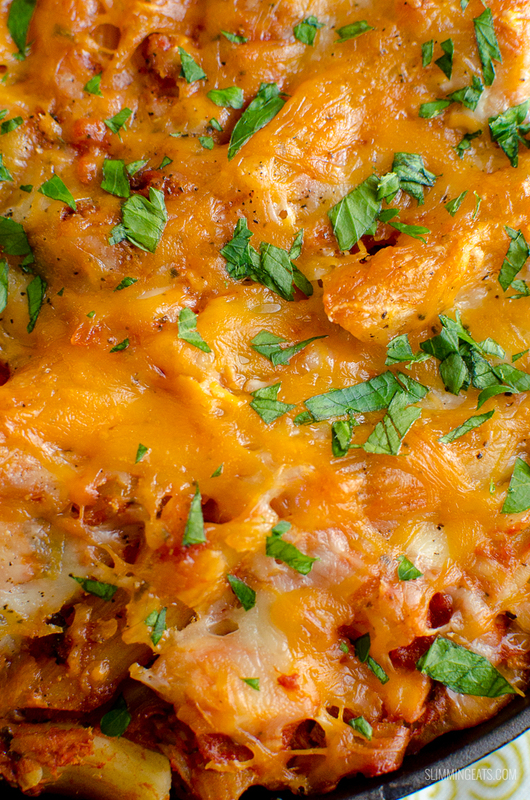 Because you can never have enough cheese. Plus cheddar just goes perfectly with tuna, ever had a tuna melt? Delicious, right? Of course, if you only have one type of cheese in the fridge, any will do. For the fresh vegetables used in this Tuna Pasta Bake, I just added what I had available – onions, cherry tomatoes and a yellow pepper. But really you can use any vegetable in this that would go well with the tomato-based sauce. 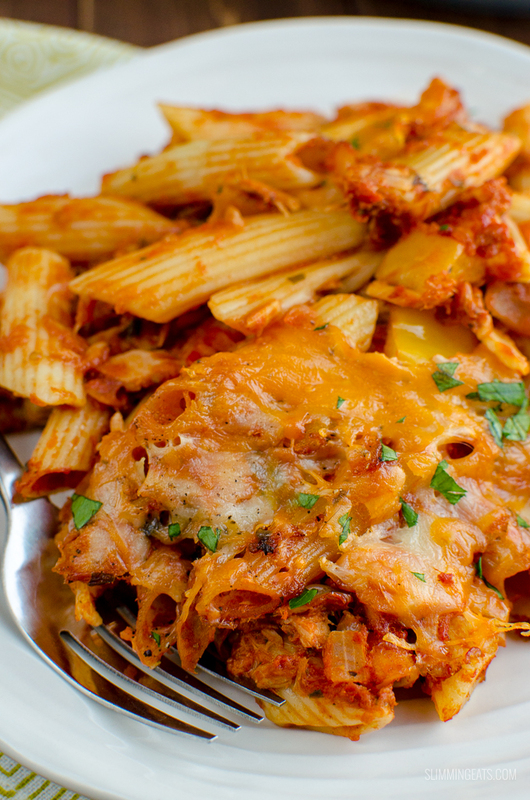 The beauty of this Tuna Pasta Bake is keeping it simple by using what you have on hand. Once all the ingredients were ready to combine and be baked. 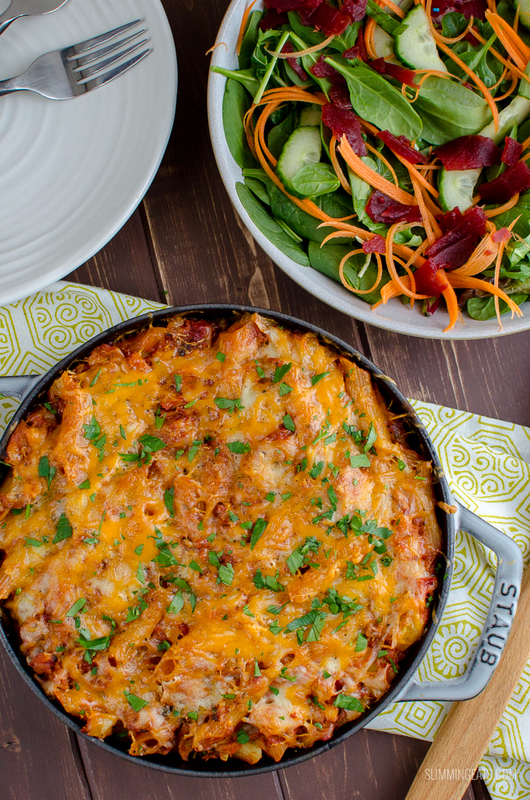 I use my cute little Staub pan, as it was just the perfect size for this Tuna Pasta Bake. Plus as it’s a cast iron pan it retains the heat really well, keeping the bake nice and warm to serve up in the middle of the table with a mixed salad. My kids love a dish where they can help themselves, encourages them to eat better too if I serve it this way, rather than dishes it up on a plate for them. Any oven-proof dish will work fine though, so just use whatever dish you have. HOW CAN I ADD A 1/3 SPEED FOODS TO THIS TUNA PASTA BAKE? You already have speed foods in the pasta bake, such as onion, garlic, pepper, tomatoes, but I also made up a big mixed salad of baby greens, cucumber, julienned carrot using my julienne peeler and some beetroot). 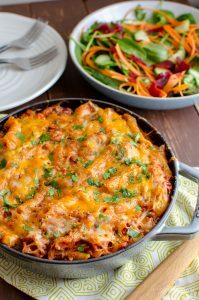 What kitchen Items do I need to make this Tuna Pasta Bake? Add the onion and garlic and fry until softened. Add the tomatoes and yellow pepper and continue to fry for a couple of minutes. Add in the passata, stock, splash of Worcestershire sauce and some fresh chopped parsley. Bring to a boil and then reduce heat and allow to lightly bubble until it reduces down and thickens (approx 10 mins). While the sauce is reducing, cook the pasta according to package instructions, until al dente. drain and then stir into the sauce along with the tuna. Sprinkle on top the cheddar and mozzarella and season with a little salt and black pepper. Place in the oven and bake for approx 30 mins until cheese on top is melted and lightly golden. How many syns is this on a green day? is this 180 gms of cooked pasta ???? Tonight I wanted a quick meal but filling too. This was delicious. Easy to make and felt like proper comfort food! Hi Amy, so glad you enjoyed it. Sometimes the simplest of recipes can be the most enjoyable, it just shows that recipes don’t always need to be complicated. Thank you for commenting. Absolutely amazing taste. My little one doesn’t normally like tuna but she loved this pasta bake. Thank you!